In this time of mounting hostility toward immigrants, economic uncertainty and massive women’s marches, a surprising new play premiered at the American Shakespeare Center’s theater in Staunton. Sandy Hausman reports on the original production of Shakespeare’s Sister. When 28-year-old playwright Emma Whipday was in college, she had an idea. But she didn’t like how Virginia Woolf handled the story of Shakespeare’s ill-fated sibling. “It has Judith becoming pregnant and committing suicide, because she thinks a poet’s heart is incompatible with a woman’s body," Whipday explains. So she wrote something for the stage. But when she gets to London, Judith discovers it’s illegal to write a play like the one she has penned -- based on a Bible story, and women are not welcomed as playwrights or actors. That's why she turns to the local madam and her girls, who are excited by the chance to perform in a secret play. Whipday wrote in modern day English, making it easy for an audience to follow the dialogue, but she used certain words and sentence structures to evoke Shakespeare’s time. To her surprise, the lines rolled easily off the tongues of an American cast in Virginia. 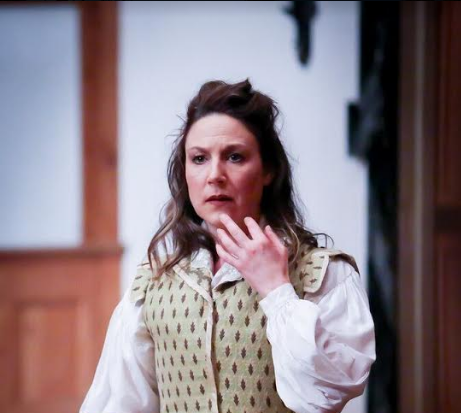 Ginna Hoben plays Judith Shakespeare, an aspiring female playwright, in the world premiere of Shakespeare's Sister. Shakespeare’s Sister is – in some places – comedy and in others tragedy, but it’s always relevant, since it turns out Shakespeare’s time had much in common with our own. Shakespeare’s Sister is on stage through April 7th. Next up for Emma Whipday, an adaptation of Sense and Sensibility, which will be on the bill at the Blackfriars Theater in Staunton next year.